Going into the last race, Bruce Golison and Becky Nygren - Frosh members of the Lido 14 Class of 2009 - were tied in points with Class Champion Stu Robertson and Michael Anctil. And in the last downwind leg of the last race, it was a close contest two teams - with Bruce driving into an overlapped situation with Stu. But after some tactical luffing, Bruce found himself sailing into a wind hole and losing contact both Stu, who sailed on to finish 3rd. In the mean time, two additional boats passed by Bruce & Becky before they could get going again - thus their 6th place finish. Bruce is a long time one design racer, which is putting it mildly, but he's a novice to the Lido 14 and to the "inside" waters of Alamitos Bay where the Lido 14s race. Suffice to say, he learned at least one valuable lesson at this regatta. The SCYA E.E. 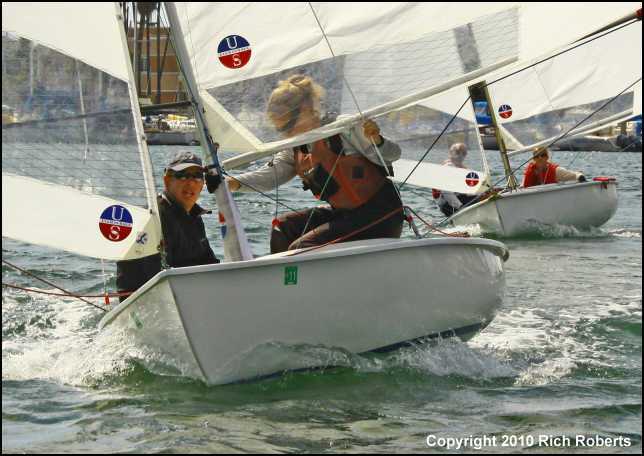 Manning Series is a dinghy regatta hosted by ABYC that awards the E.E. Manning perpetual trophy to the winner of the largest one design fleet competing. With 16 entries, the Lido 14 fleet was only about 1/3rd the size of the CFJ fleet which regularly races at this event. Not since the 1990s has the Lido 14 class participated in this event in any significant way, in part because it has conflicted with the WD Schock Memorial regatta held at Newport Harbor Yacht Club. This year the class split and sailed both events over the same weekend.